As part of a scheduled tour promoting her latest in a long string of successful hardcover books, JANET DAILEY arrived at Liberties Fine Books in Boca Raton’s popular Mizner Park on April 11th. (1996) On this particular spring evening, there was a standing room only crowd of readers and fans waiting for her. After being greeted by the store manager, she walked toward the autograph area to begin speaking and reading from her newest book, Notorious (HarperCollins Publishers, ISBN 0-06-017697-0). But a handsome, smiling gentleman standing by a display of her books brought the multi-published author to a complete stop. Surprised and delighted, Janet Dailey exchanged a quick hello before finally continuing on to the microphone by the writing desk and wingback chair. Flustered and happy, she informed the audience that her “former boss” was seated among them. A man who everyone soon learned was none other than Richard Bellringer, president of Harlequin Enterprises when she began her writing career. At the time, Janet explained, Harlequin writers were primarily English and she became the first North American writer to actually write for the Harlequin Presents line. A member of the audience, Paz Kent, even had a copy of that first book, No Quarter Asked (1976), with her to be autographed. Ms. Dailey reminisced that she and her husband, Bill, traveled in a trailer to each of the fifty states and she wrote one Harlequin book for each state. During this time, many in the audience commented, they became her readers. Ms. Dailey continued to answer questions and speak about her present book, Notorious. Before signing copies for fans, Janet Dailey invited Mr. Bellringer and his wife, Alma, to join her for coffee after the signing so they could continue their unexpected but welcome visit together. Later, Richard Bellringer, who has a winter home in the Boca Raton area, mentioned that he had seen a mention of Janet’s visit in the Boca Raton News that morning and decided to attend. He spoke with members of Janet’s audience while Janet signed copies of new and old books. He and his lovely wife, Alma, divide their time between Florida and Ontario, Canada, where he remains active in a large international family business. But, he confessed, he still very much enjoys speaking with new writers. A career highlight of his days as Harlequin president was his association with Janet Dailey, an amazingly talented writer. 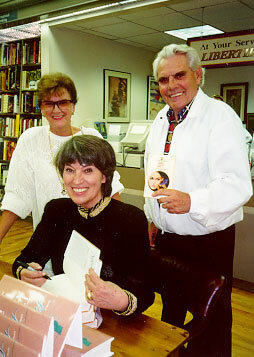 Photo: Janet Dailey signs copy of her latest book, Notorious (Harper Collins), while Richard and Alma Bellringer watch. Mr. Bellringer, formerly president of Harlequin and once Janet’s “boss”, holds a copy of her first Harlequin Presents book, No Quarter Asked, published in 1976. One Response to Janet Dailey. You’ll be greatly missed. I am saddened to learn of the death of Janet Dailey. I was an avid fan of hers from the time she started writing. Her warmth, humor and character shone bright in her novels. The characters were people you could see and feel. Reading her books was a wonderful experience. Her novels will be read and enjoyed, fresh and not diminished by time. It will be sad to know her creativity in the future will be silent. I hope her family and friends know how much her fans received from each and every book. All who knew her and her work will miss her. I wish for people who have not read her will enjoy her work in the future.